In 2018, 100 manufacturing plants earned ENERGY STAR certification within the U.S. for their superior energy performance. Together, these U.S. plants reduced their energy bills by more than $400 million, saved more than 70 trillion British thermal units (TBtu) of energy, and achieved broad emissions reductions, including 4.5 million metric tons of greenhouse gas emissions. The energy savings are enough to meet the annual energy needs of nearly 440,000 American households. In Canada, 13 manufacturing plants earned ENERGY STAR certificaiton for the first time in 2018. 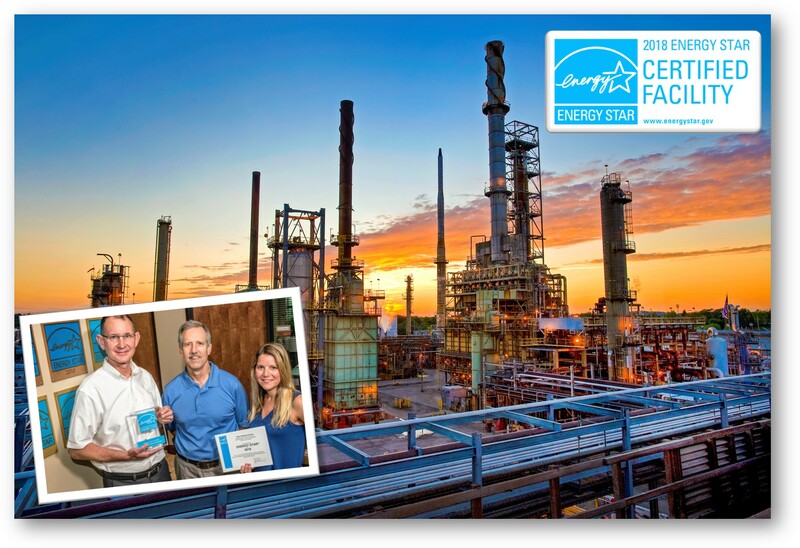 Bradley McKain, General Manager; Barton Fredrick, Energy Technologist; and Melissa Sherry, Energy Coordinator of the Marathon Petroleum Corporation's Canton Refinery holding ENERGY STAR 2018 Certified Facility certificate. Click here to see EPA's full press release announcing 2018 ENERGY STAR certified facilities.